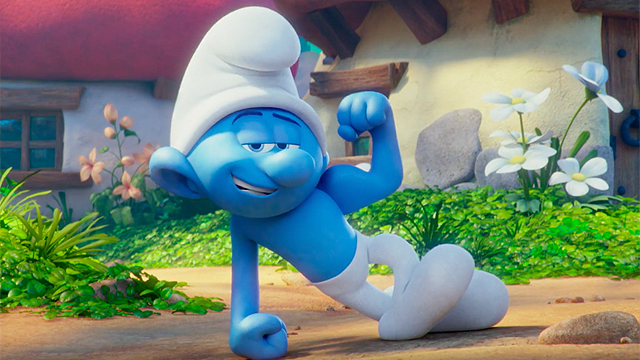 This April, Sony Pictures Animation is returning to the world of The Smurfs with a new take inspired by the original Peyo comic strip. Directed by Kelly Asbury (Shrek 2, Gnomeo & Juliet), Smurfs: The Lost Village features a voice cast that includes Demi Lovato as Smurfette, Rainn Wilson as the evil Gargamel, Joe Manganiello as Hefty, Jack McBrayer as Clumsy, Danny Pudi as Brainy, Mandy Patinkin as Papa Smurf, and Michelle Rodriguez, Ellie Kemper, Ariel Winter and Julia Roberts as SmurfStorm, SmurfBlossom, SmurfLily and SmurfWillow, respectively. The voice cameos will include Gordon Ramsay as Baker, Gabriel Iglesias as Jokey, Tituss Burgess as Vanity, Jeff Dunham as Farmer, Jake Johnson as Grouchy, and director Kelly Asbury himself as Nosey. CS recently paid a visit to Sony Pictures Animation’s Culver City campus and spoke with some of the talent involved in The Lost Village. Today, we’re sitting down with Joe Manganiello who is no stranger to comic adaptations. He made his feature film debut in Sam Raimi’s original Spider-Man and he’s also set to play Deathstroke in Warner Bros. Pictures‘ The Batman. In the below conversation, the star explains his childhood connection to The Smurfs and offers an interesting explanation for why he loves embracing bigger than life stories. 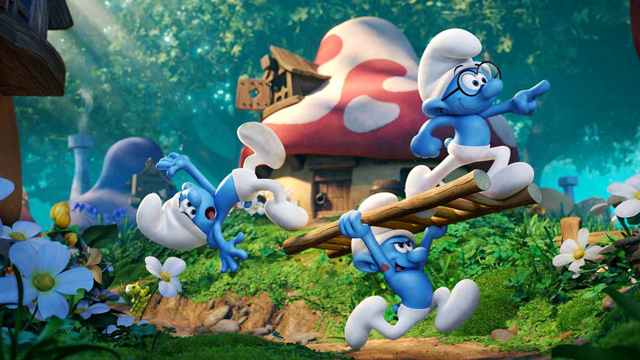 Smurfs: The Lost Village will open in theaters on April 7, 2017. Check back soon for our conversation with director Kelly Asbury! CS: When did The Lost Village first come your way? Joe Manganiello: I got a phone call to offer me the role. They wanted me to come in and meet with them. It was sort of a pitch meet. They showed me all the artwork and explained to me the story. They showed me some of the script and the storyboards. Out of that session, I knew this was something that I obviously wanted to be a part of it. It was a franchise that I grew up with. It’s something so iconic. It was kind of in the back of my mind that I wanted to do something that my two and a half year old niece could see. She’s going to grow up and she’s not going to be allowed to watch any of Uncle Joe’s stuff until she’s 20. (Laughs) This is going to be really fun. It’s the first time we can take her to the movie theater. CS: Does that sense that you’re making something for all ages affect the way you approach the character? Joe Manganiello: Definitely. I think that there’s a part of you that gets woken up. It wakes up the kid in you. You start seeing the movie or the performance through the eyes of a child. There’s a part of you that’s performing to make kids laugh, but there’s also a part that wants to make the parents bringing the kids laugh, too. There’s a dual nature to the performance. You’re playing for two audiences at the same time, which is very fun. CS: What is Hefty’s role in the Smurf village? 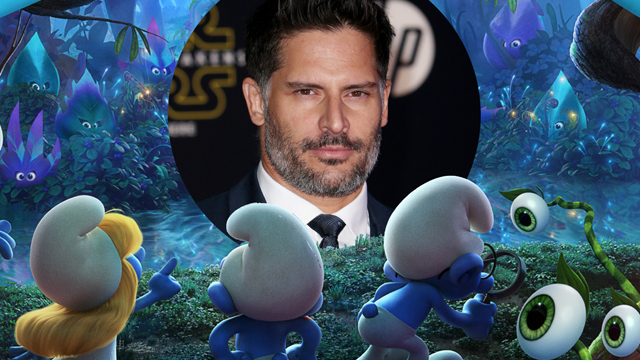 Joe Manganiello: He has normal human-sized strength in the body of this little blue guy. That was really fun, because I could really stretch his tough guy side. But it’s also juxtaposed with this closet romance with Smurfette. He’ll kind of trail off into these very poetic offerings for Smurfette. CS: Hefty winds up going on an adventure with Brainy, Clumsy and Smurfette. Does he have an archetype that plays off the others? Joe Manganiello: It’s interesting that Hefty falls into an archetype, but he also goes beyond it. When he walks onto the screen, he comes off as an archetype and exactly who he is. Or so you think! But then you find out that there’s this other dimension — or other dimensions — to the character, which I think is really fun. That ends up being where the lessons get dealt. For me, I think it’s a fun little ensemble in that each one of the characters has their own very specific voice. You have this group of boys who are helping Smurfette on her quest to figure out what it is about her. The other boys have all these specialities and she doesn’t really have her own. What really attracted me to that story was the aspect of chivalry, which often gets lost or put down in today’s day and age. I think it’s really important for boys to continue to be chivalrous and to continue to protect and take care of the girls they love. CS: In speaking with director Kelly Asbury, he mentioned that the original Peyo comics were a huge inspiration. Were you at all familiar with them going in? Joe Manganiello: Sure, I was. But as a kid, I had the Saturday morning cartoon. I watched every single episode. That’s one of the things that was very attractive for me. I always thought it was creepy when they described the Smurfs as three apples high. That’s like a gremlin. The fact that they are returning them to the way that Peyo intended. I was always a big fan of that artwork. 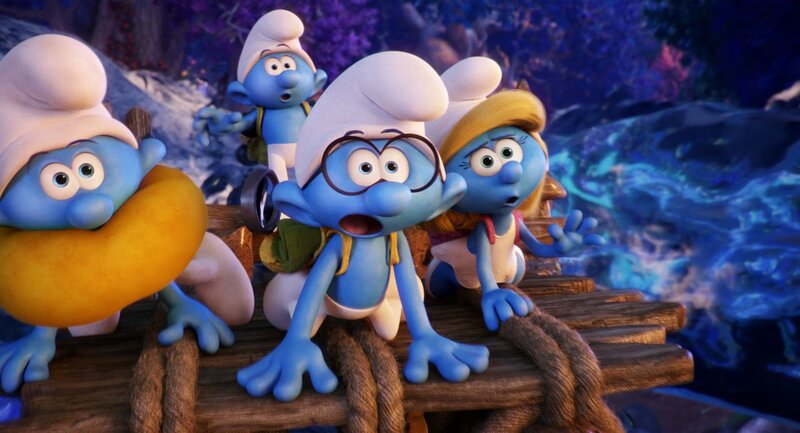 It makes the Smurfs a lot cuter, which I think is going to play really well with kids. My niece is going to love all the Smurfs. CS: He also mentioned that the tone is very much an ’80s adventure story. Joe Manganiello: Sure, I would agree with that. I think there’s also something timely about there being two separate tribes that grew up apart from one another and who wind up putting aside any differences they have for a common good. That’s something that seems like it’s on everyone’s mind right now. CS: What was the biggest surprise you discovered about the Smurfs? Joe Manganiello: The biggest surprise was that I enjoyed it as much as an adult as I did when I was a kid. I just got to view the full movie a couple of weeks ago and it was so much fun. I found myself laughing at the cat, Azrael. I loved him as a kid and I found myself laughing again as an adult. It was nice to just be reminded why the franchise is timeless and of why it was so beloved in the first place. There’s just something people love about these little blue characters. CS: You’ve been tied to quite a few comic book properties from Flash Thompson in Spider-Man to Deathstroke in the upcoming Batman movie. Are comic book films something that you actively gravitate towards? Joe Manganiello: Maybe on a subconscious level, now that you mention it. Growing up, I was an avid comic book reader and cartoon watcher. Still to this day, I keep up on comics and hang out with a lot of people that read a lot of comics. I think that it’s something I enjoy and, when you’re generally passionate about something, it makes hard work easy. I’ve probably gravitated towards projects like those because I really am passionate about them and want to do a good job. CS: It seems that comic book worlds let you step into bigger than life characters. I imagine that’s something very fun for an actor. Joe Manganiello: I think that anything larger than life is an excuse to talk about being human. “True Blood” was a really good example of that. The first season, when you boil it down, the undercurrent was marriage equality. You had racism and classism. In my case, with the werewolves, it was about the violence that lies in the heart of man. You’re talking about these big, larger than life characters, but it’s an easy delivery system to talk about being human. Which is exactly what the Greeks did. Their plays were very big in scope, but the characters were very, very human. The gods, even, were very, very human characters and that helps us to talk about it. You can have a serious talk about the Smurfs if you really wanted.